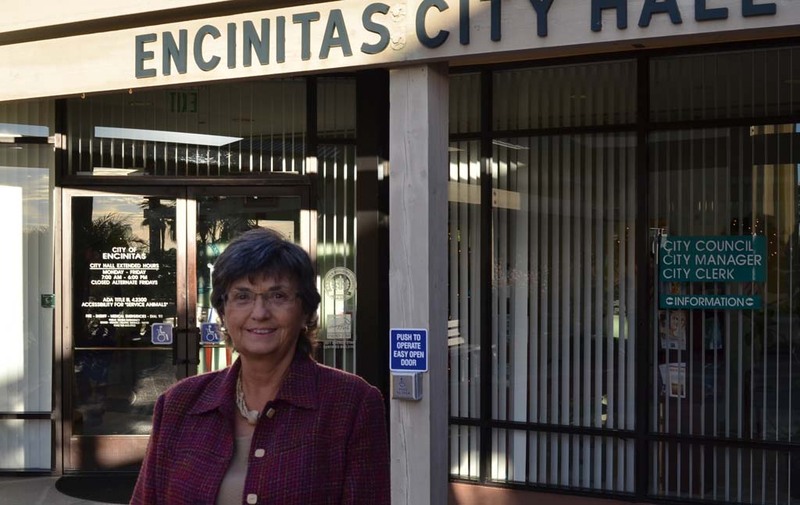 ENCINITAS — Mayor Teresa Barth had one major goal when she was chosen to lead the city one year ago: change the tone of council. Prior to being named mayor, she said her previous years on the council were tumultuous at times due to bickering between council members and their supporters. From Proposition A to new rules for alcohol permits, there’s been no shortage of hotly debated items over the past year. Barth said although council members have disagreed on issues, she’s proud they’ve maintained a good working relationship. At a meeting on Tuesday, council members and two residents praised Barth for bringing a feeling of mutual respect to the dais. On the flipside, some former supporters of Barth have vocally criticized her for opposing Prop A — the land-use initiative that passed this summer. For her part, Barth said it was unfortunate that Prop A turned “ugly” like past Encinitas elections. Looking at other parts of the year, Barth said she’s excited that the city embarked on “strategic planning.” The idea was tossed around last year, but embraced by the council this year. Down the line, council will prioritize funding for projects discussed during the workshops. For Barth, other highlights include council voting to make public safety issues a part of the Traffic Commission. The newly minted Traffic and Public Safety Commission is expected to debut next year. And she touted new council communications guidelines. This included extending oral communications at the beginning of every council meeting by 15 minutes, bringing the total time to half an hour. Barth took a council seat in 2006, was reelected in 2010 and named mayor for the first time last December. After being a council member for so long, she’s still not used to being referred to as the mayor. “It surprises the heck out of me,” Barth said with a laugh. However, she’ll have more time to become accustomed to the title. The council voted to give her six more months as mayor, and then she’ll finish out her term as a council member. She said the role came with added responsibilities like attending neighboring cities’ events, answering more emails and signing off on city checks. Next year, voters will elect a two-year mayor for the first time. Residents will also select a council member who will serve for four years. Barth ruled out running for council due to the length of the term. She’s yet to make up her mind on whether she’ll enter the mayor race. In the meantime, she looks forward to next year. Barth said she’d like the city to continue renovations on Moonlight Beach by replacing the outdated lifeguard tower. The beachside infrastructure is critical to Encinitas’ economy, she said. And she’s eager to see the city engage residents with new technology. The city decided it would like to gather citizen input through structured online forums like MindMixer or Peak Democracy. “People’s lives are different,” Barth said. “They’re not 9-5, Monday through Friday — come to a council meeting and say your bit and then go home. “You need to come to the citizen, instead of the citizen coming to you,” she added. Another frequently discussed issue this year: the city’s housing element. To complete the housing element, the state department of Housing and Community Development initially required that Encinitas plan for 1,300 housing units. Barth praised new Planning Director Jeff Murphy for “taking a hard look” at the housing numbers this year and making it easier to meet the goal. Because the planning department took stock and credit for existing housing in Encinitas, the city will have to pencil out fewer units — between 670 to 1,030. Maps showing where housing could be located will be shared with each of the city’s five communities at future meetings. Eventually, the goal is to take citizen feedback and put the housing element to a citywide vote. “I’m optimistic going forward,” Barth said. “Number one is that we changed the tone,” she added.